Orbs are mysterious circular anomalies that appear in photographs without any obvious explanations. Such anomalies have been appearing in photographs taken around the world for decades, with equal frequency indoors and outdoors (where the air is much cleaner than indoors). There is no relation at all between the appearance of such anomalies and the cleanness of air. In almost all cases such anomalies show up in photographs taken in completely ordinary air. 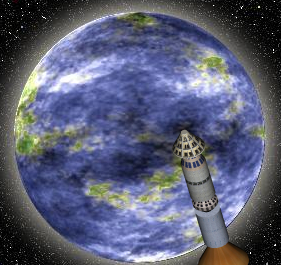 Skeptics claim that such orbs are merely out-of-focus dust particles. 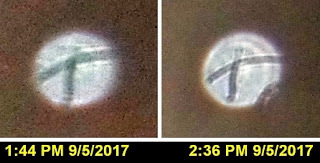 Before discussing and showing a consideration that completely defeats such a claim (a very strong effect of recurring patterns in mysterious striped orbs), I will briefly discuss the general reasons for rejecting the skeptical “orbs are just dust” explanation. 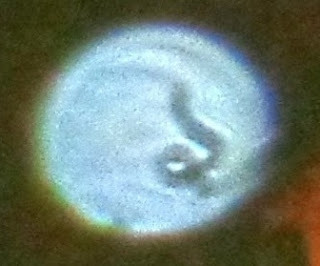 Most of the more remarkable orbs that have been photographed cannot be explained as dust, because they are either too big to be dust, too bright to be dust, too fast-moving to be dust, too colorful to be dust, too regularly observed to be dust, too surrounded by clean air to be dust, or having too many sharp, clear details to be dust. When you actually look into the size of dust particles in ordinary air, you will find that they are thousands of times too small to produce orbs of the size frequently seen in the better orb photographs. Orb photographers often publish photos showing orbs that are about 10% to 15% of the width or height of the original photos. To produce such an orb, a particle in front of the camera would need to block more than 1% of the area in front of the camera lens. But dust particles in ordinary air (being only about 1 micron outdoors and 10 microns indoors) are only big enough to block about a millionth of the area in front of a camera lens (about 100 million microns). If it were true that dust particles in ordinary air were sufficient to produce orbs, then people would constantly be getting orbs in their flash photos. But fewer than 1 percent of photographers get orbs in their photos. It is true that you can get small unimpressive-looking dust orbs in photos by vigorous efforts such as by putting a shirt under your bed and then whipping the shirt around, but that proves nothing to discredit photos taken in ordinary air (because when you do such a drop-and-shake stunt you are briefly raising the average particle size in the air by a hundred-fold). Then there is the fact that mysterious orbs photographed indoors often show what looks exactly like extremely fast motion, of a type we would never see from dust particles (which move at only 2 miles per hour indoors) – a kind of “string of pearls” motion (shown here) in which we can seem to see multiple position states of an object hurtling at incredible speeds. Skeptics have a variety of ingenious explanations to try to explain away such photos, but none of these attempts work, for the reasons discussed in detail here. The fact that mysterious orbs so often appear with colors of blue, pink, purple, green, orange, red, and yellow is another fact completely inconsistent with a dust explanation. For example, I have photographed more than 1100 mysterious blue orbs both indoors and outdoors, as well as more than 400 mysterious purple orbs (as shown here). Attempts to naturally explain such colors do not work, for reasons discussed here. Before noticing recurring patterns in mysterious orbs I photographed, I started to get a striping effect in mysterious orbs that is in itself sufficient to rule out a dust explanation. 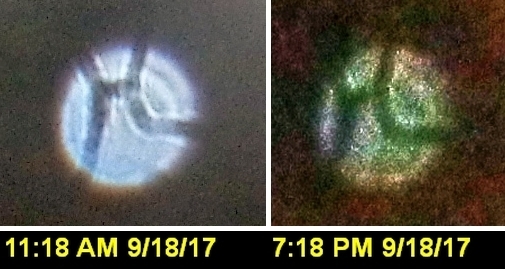 The effect I saw was that again and again mysterious orbs that I photographed would have sharp, clear stripes, often stretching from one side of the orb to the other. A large fraction of the stripes were straight, but just as many of the stripes were curved. I may note that prior to the time I reported this effect in 2015, no one ever reported seeing stripes in any type of airborne particles. So you can't say “those were just dust stripes” – because if it is possible to photograph stripes in airborne dust, how could it be that no one reported such a thing prior to 2015? By now I have photographed more than 400 mysterious orbs with stripes, all photographed in dry air. You can see all of these photos (posted between July 2015 and the present) by using this link and continuing to press on the “Older Posts” button at the bottom. One reason why such orb stripes cannot be explained through any type of dust explanation is that such stripes are an example of clear, sharp details – and such clear, sharp details are exactly not what we would expect to see in out-of-focus particles appearing near the camera. Things got even more interesting when I started to notice many repeating patterns in mysterious orbs that I photographed. I have so far noticed 23 of these repeating patterns in striped orbs I have photographed. The best way to see examples of all of these patterns is to look at the long blog post here, which includes two or more examples of each of these patterns (in some case as many as 28 examples of a particular pattern). If you are not energetic enough to click on the link and scroll down, you can instead merely look at the grid below, which combines many of these photos. The best way to see the grid below is to click on it to open it in a separate browser tab (which will show the grid in higher resolution). None of the items we see above are patterns that showed up in consecutive photos. So I am sure that none of these photos was caused by some camera irregularity (such as cracks or lines on the camera lens). Such an irregularity would cause a photo anomaly that would show up in consecutive photos; but none of these anomalies appeared in consecutive photos. Within the red rectangle of the grid, we see 8 examples of an inverted-Y pattern. Inside the yellow rectangle of the grid, we see 10 examples of a curved stripe pattern appearing either at the top or the bottom of an orb. Within the purple rectangle of the grid, we see 13 examples of a horizontal stripe pattern, in which we see a belt-like stripe on an orb. Inside the green rectangle of the grid (at its lower left part), and the row below it, we see 7 T-shaped stripes, three of them having a break between the lines and a slanted top. Inside the pink rectangle we see three r-shaped stripes. Inside the light blue rectangle at the bottom left of the grid we see three J-shaped stripes. Inside the orange rectangle of the grid, we see 8 cases of a pattern consisting of a vertical stripe stretching down from the top of the orb, with a little circular feature directly underneath that stripe. The pattern appearing most often is shown inside the green rectangle of the grid, where we see 28 examples of mysterious orbs with a stripe stretching from the top right corner of the orb down to the opposite side of the orb, on the bottom left corner. Assuming that only natural particles were being photographed, how often would a photographer expect to see this many pattern repetitions? Not once in a thousand reincarnated lifetimes. That's simply because there are so many ways in which random marks might be arranged within natural or random particles. Consider the following math. Imagine there are two strangers in different houses who are each told to randomly arrange 23 black tiles on a scrabble board that is a 15 by 15 grid. There are 225 places for the first person to arrange his first tile, so the chance that they will both place the first tile in the same spot on the grid is 1 in 225. The chance that they both will put the second tile on the same spot on the 15 by 15 grid is 1 in 224, because now one of the spots on the grid is already filled. We can calculate the chance of the two strangers randomly positioning their tiles on exactly the same 23 spots on the 15 by 15 grid as follows: it is (1/225) *(1/224) *(1/223)*(1/222)*(1/221)*(1/220)*(1/219)*(1/218)*(1/217)*(1/216)*(1/215) *(1/214) *(1/213)*(1/212)*(1/211)*(1/210)*(1/209)*(1/208)*(1/207)*(1/206)*(1/205) *(1/204) *(1/203). This equals 1 in 2 x 1054 -- which is about 1 chance in 1 followed by 54 zeroes. This is about the chance of you meeting 6 strangers, and correctly guessing all of their 9-digit Social Security numbers on the first try. This calculation simply gives us a hint of how fantastically improbable it is that two random patterns will coincidentally match. Given that type of math, we absolutely should not expect for a single photographer in the world to get even a single case of distinctive random patterns repeating 8 times or more in mysterious orbs he photographed. The chance of anyone getting 23 repeating patterns, with some repeating as many as 28 times, is some probability so microscopic it can scarcely be calculated. Here's another example to show how improbable is that random patterns might match, but in this example an exact match will not be required. Let's imagine 3000 people in a large auditorium. What is the chance that even two of them would have a Social Security number differing by only one digit? A Social Security number is 9 digits. There are 81 different 9-digit numbers that differ by only one digit from any Social Security number. We can consider these “matching patterns.” There are about a billion possible Social Security numbers. So the chance that one person will have a Social Security number with a pattern matching that of the person next to him (considering a 1-digit deviation as a pattern match) is about 1 in a billion divided by 81, or 0.000000081. But with 3000 people in the auditorium, the chance that one particular person will have a Social Security matching the pattern of another person in the auditorium is about 0.000000081 multiplied by 3000, or 0.000243. But what about the probability that as many as 25 of these 3000 people would have a Social Security number with the same pattern (differing by less than one digit)? 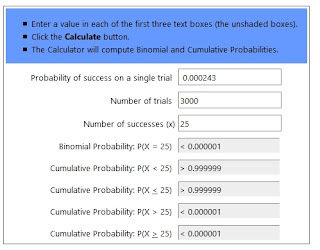 To calculate that you would need to use a thing called a binomial probability calculator. When we use the one at StatTrek.com, which you can access here, it tells us that the chance of this is less than 1 in a million. The StatTrek calculator actually won't show any probability less than 1 in a million, and simply displays such a probability as less than .000001. I have a Java binomial probability calculator that I have tested successfully with benchmarks. When I try this example, it tells me that the probability is 2.6177844832578667E-28, which is roughly 1 in 10 to the twenty-eighth power (about than 1 in 10,000,000,000,000,000,000,000,000,000). The example here very roughly corresponds to the probability of some orb photographer taking 3000 photos of mysterious orbs (such as I have), and getting a matching pattern on 28 of them (such as I have done in the case of orbs with a stripe stretching from the top right corner to the lower bottom corner, as you can see in the green rectangle of the grid above). But the probability of getting so many matching patterns as I have got would actually be much smaller, since the chance of getting a matching pattern on a Social Security number (with a match of 8 out of 9 digits) is actually much greater than the chance of getting a matching pattern on a circular object which might have marks or lines arranged in any of a trillion quadrillion different ways. So the chance of getting only the pattern recurrence shown in the green rectangle in the grid above seems to be less than 2.6177844832578667E-28 (about 1 in 10,000,000,000,000,000,000,000,000,000), and the chance of also getting all of the other pattern matches in addition seems like some number even more microscopic. The math above merely hints that the chance of getting as many pattern repetitions as I have got is essentially zero, if only chance was involved. The same thing is suggested by human experience with snowflakes. These are natural objects that can have a vast variety of appearances. But no one ever observes the same pattern repeated. On two days I have twice photographed the exact same pattern repeating on the same day. Below is one example (reported here) showing a “T” letter inside two mysterious orbs I photographed. Note how both "T" shapes have the same distinctive look, with a slanted top. Below is another example (reported here) in which we see an “H” letter in two orbs I photographed on the same day. In both cases the right “leg” of the “H” letter curves upward. In both of these cases I took many ordinary photos between the photo on the left and the right, and such ordinary photos showed no such pattern. 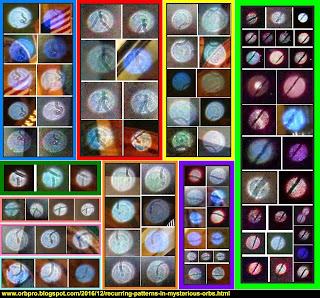 Postscript: Below is a 26-minute youtube.com video I created, compiling more than 500 photos I have taken of mysterious striped orbs. Click on the icon at bottom right to watch the video in full screen mode.